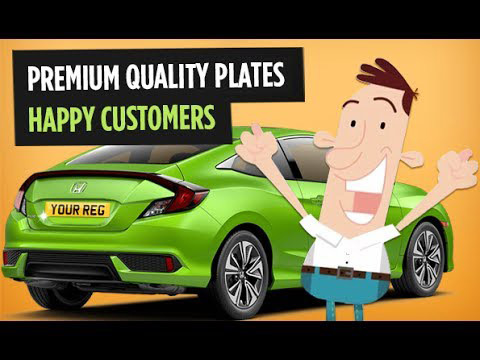 Show Plates Direct is the UK's No 1 show plates & number plate maker, we make high quality replacement registration plates and showplates that are guaranteed to last! You’ll love our service, our plates are high quality, and delivered direct to you with a range of delivery options. Select your vehicle and the relevant options will appear in the for such as vehicle specific sizes and fonts. Show Plates are intended for off road use such as car shows, bike shows, show rooms, weddings, race days and more. You have more styling choices with a show plate such as your own slogan and more font choices. Legal Style plates meet all the requirements for road use including BS number and state Show Plates Direct + post code as required by law. Choose the plate size relevant for your car. The majority of cars use 'STANDARD CAR' size which are 520 mm × 111 mm, the majority of bikes use Standard Bike size which are 9" x 7", but some vehicles do have specific plate sizes. If your plate sizes look non standard, and your unsure, a quick check with a tape measure will tell you all you need to know. Choose the font you'd like for your Reg. Legal font options include Standard, 3d, Carbon and Hi Line. If you have selected Show Plates in 'Plate Type' you will also have many Show Plate font options to choose from. Experiment and see which like best. You have the option to select a border on your plate. You can choose the colour, and thickness of the border. Choose from many badge options. They are grouped by flag type. Select the Badge group first, then the spefic flag you'd like and the colour. Choose from many badge options. They are grouped by flag type. Select the specific flag you'd like and then the badge colour. Choose the slogan font. If you choose the plate type 'Show Plate' you have the option to write own slogan, just write anything you like here! Legal Style plates state Show Plates Direct + post code as the slogan as required by law. If this is what you prefer, select 'Legal Style' and legal slogan and BS number will be selected by default. Choose the slogan colour. If you choose the plate type 'Show Plate' you have the option to write own slogan, just write anything you like here! Legal Style plates state Show Plates Direct + post code as the slogan as required by law. If this is what you prefer, select 'Legal Style' and legal slogan and BS number will be selected by default. Choose the slogan size. If you choose the plate type 'Show Plate' you have the option to write own slogan. Legal Style plates state Show Plates Direct + post code as the slogan as required by law. If this is what you prefer, select 'Legal Style' and legal slogan and BS number will be selected by default. Extremely fast delivery, superb quality Show Plates, would not hesitate to order from them again. Great product and helpful service when I made a mistake. Plates were delivered within the next business day, great service and automated email notification of where they were during the process. Highly recommend Show Plates Direct!